• Family Dollar, 303 E. Main St., Oct. 26. Complaint. Complaint received that shelving in milk coolers are very dirty. Investigated complaint. Complaint is valid. Shelving in beverage cooler has accumulations of black mold-like residues and shelving is rusty. Critical: Packages of raw bacon found stored above packages of hot dogs. • Subway, 2855B SR 73 South, Wilmington, Oct. 26. Critical: Inside of ice chute on soda fountain is dirty. In display/line case, ham was 44°F and roast beef 43°F (must be 41°F or less). At soda machine, tubing down in drain. There was a Raid trap stored under front prep cooler that was stuck to salad bowl with bugs on trap. Please contact pest control operator to assist with bugs. Crackers and napkins stored under hand sink in front. Norlake cooler, plastic strip inside coming out. Continental 2-door freezer, doors pop open when closing. Seal along edge of prep cooler coming off. • New Vienna 1st Stop, 101 N. South St., New Vienna, Oct. 31. Critical: Employee handling food items did not wash hands between tasks at the cash register and handling samdwiches. Hand soap dispenser at hand sink is broken. Employee handling food did not have anything restraining hair. Fly swatter stored on top of hand sink. Floor fan has dust accumulations. Light bulb nonworking in fixture above 3-sink. Small holes in exit door need sealed. Ice accumulations found in walk-in freezer. • New Vienna Elementary School, 301 E. Church St., New Vienna, Oct. 31. Verification/documentation verifying employees know when to report illness unavailable. Wash cycle on warewash machine is at 101°F (must reach 120°F). Person in charge to contact maintenance for repair. Wet cloth stored on counter in-between use. Dust/black residues accumulated on ceiling of walk-in cooler. Purses stored next to stand mixer in kitchen. • Damon’s, 1045 East Side Drive, Wilmington, Oct. 29. Complaint. 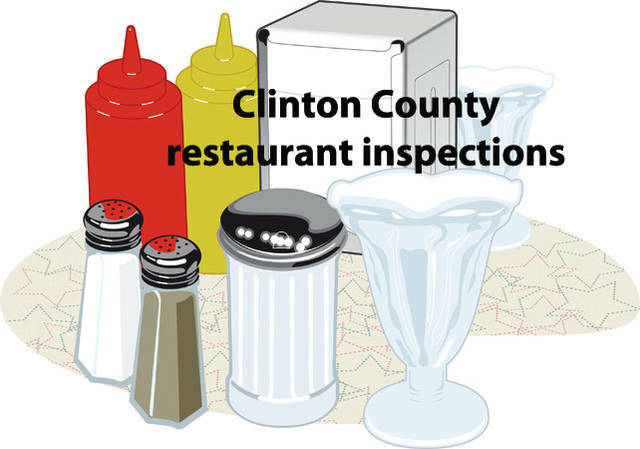 Complaint claims: tray of ribs was dropped on floor and ribs were served; not using gloves in prep food; and, employee eats fries that are held in warmer in kitchen. Investigated complaint. Spoke with owner and manager. Discussed claims of complaint. Person in charge indicated if food is dropped on floor it is immediately discarded. Gloves are used frequently and changed as needed. Employees do not eat in kitchen. They have discussions to prevent employee from stealing food. Managers commented they recently terminated an employee. Did not observe claims at time of visit. • Sabina Elementary School, 246 W. Washington St., Sabina, Oct. 31. Critical: Verification/documentation verifying employees know when to report illness unavailable. Dust accumulated on fan in warewash room. • Food Mart, 149 W. Washington St., Sabina, Oct. 31 Follow-up #2. Thermometer missing in cooler holding retail sandwiches. Light nonworking in retail coolers. Counter at soda fountain machine/sink is damaged. Unused equipment stored in facility. Lights nonworking over unused equipment. • Laney Cakes Bakery, 151 W. Main St., Wilmington, Oct. 20. Grand opening scheduled for mid-November. • Holmes Elementary School, 1350 W. Truesdell St., Wilmington, Oct. 26. Cove trim and corner at exit door is damaged/not secure. Area needs repaired to be easier to clean.